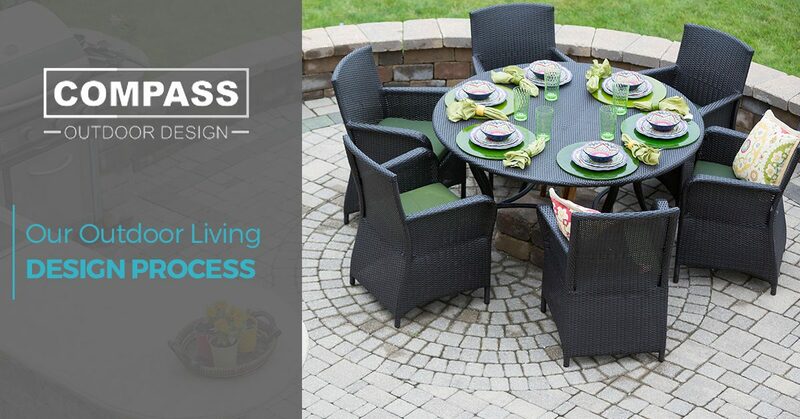 At Compass Outdoor Design, we are committed to providing homeowners with the best outdoor living spaces Dallas and the Fort Worth area have to offer. Our company’s goal is simply to meet the outdoor needs of our customers, and we’re willing to work with you every step of the way to design and build something that fits your style, your needs, and your budget. Part of the reason why Compass Outdoor Design is one of the leading designers and builders of outdoor living spaces is because of our project methodology. Our meticulous attention to each and every detail creates a uniquely professional and stress-free experience for our customers. Our team understands that great outdoor spaces require more than just site-appropriate plantings, but a master plan that follows all phases of the process to create a successful design with the highest level of service to our clients. Once you have contacted our outdoor living design company, we’ll begin your project with a consultation performed by one of our expert landscape architects/designers. This is a time for our team to gain a precise understanding of everything you’re envisioning and your unique goals for your project. Whether you are interested in an outdoor kitchen and outdoor fireplace or have another idea in mind, we’ll take the time to listen to your ideas, wants, needs and budget, then we make suggestions on how to best move forward and complete your project. Our goal is to understand your wants and needs. We are viewed as one of the best patio design companies in DFW because we really tie into your home to make it look original, we can even offer design suggestions based on your style of preference. This is also the time we can answer any questions you may have about our landscaping company and our process. We can also create 3D images and set an additional meeting to review the images with you in-person. During the second appointment, we will have a screen share meeting where we present a 2D layout of your project. At this time, we’ll be able to provide you with a better price range for your desired project. If you choose to move forward with the process and start the creation of 3D Design and formalized pricing, all you have to do is make a $250 payment for our creative services. Once payment is received we will begin to collaborate directly with our design team to finalize the layout and prepare rendered images. The next meeting will be in person where we will provide you with a written project proposal based on the design elements and budget that were previously determined during your initial consultation. Once the proposal is agreed and signed upon, we will then get started with our onsite consultation to verify that the existing conditions on your site are accurately reflected on your property survey plan and on any other plans you’ve provided. This onsite consultation will help our designers to determine the best way to utilize your outdoor space. Reviewing the information from our meetings, we will then generate a conceptual design for your property transformation. This is an important part of the process, as we present you with concept drawings and landscape renderings of your project. Sometimes, we’ll hit a home run with the first rounds of designs, other times it may take a few rounds of renderings until we are able to find a design that fits your wants and needs perfectly. We will continue to work through this process until you approve of the concept. Upon approval, we begin discussing material selection for your project. After any final adjustments to meet your wants and needs are made, the contract presentation occurs for sign-off and for work to begin. As you review the contract, we’ll be pleased to answer any of your questions and make any adjustments needed to ensure your vision for your outdoor living space will be recognized and all of your goals will be met. The installation phase of your project will be scheduled directly after you’ve approved your proposal and submitted a deposit to us. Before we begin work, our team will conduct a detailed pre-construction meeting on your site, as required, including the designer and all production managers who will be involved in your project. Additionally, we handle other logistics, including HOA approval and city permits. We also make selections during this phase. Having all these details finalized will help ensure the entire construction process of your project goes smoothly and efficiently from beginning to end. After the preconstruction work is complete, we then commence work on your project, as we’ve laid out in our scheduling. While we’re working on your outdoor living space project, our friendly, installation professionals will show the utmost respect for your home, your property, and your neighbors. We will always come prepared to perform the day’s work as efficiently and quietly as possible and leave your property looking clean and organized for the next day’s work. Once all the work on your project is complete, we perform a final walk-through with you so you can see your new outdoor living space. All that you have to do is sit back and relax as we bring your vision to reality right before your eyes. There’s no doubt, your new outdoor living space will provide years of enjoyment. We view our patio design company as an extension of you, and we recognize that the end project is your space and yours to enjoy! It is an investment of your time and money and we take pride in your excitement and pleasure in seeing the project evolve and enjoyed for years to come. Although the project is complete, it is just the beginning of a relationship that we like to build to take care of all of your outdoor living space needs. Outdoor living spaces will increase the usable area of your home at the fraction of the cost of an addition. When properly designed and correctly installed by a professional patio design company, an outdoor living space will increase your enjoyment while adding value to your home. 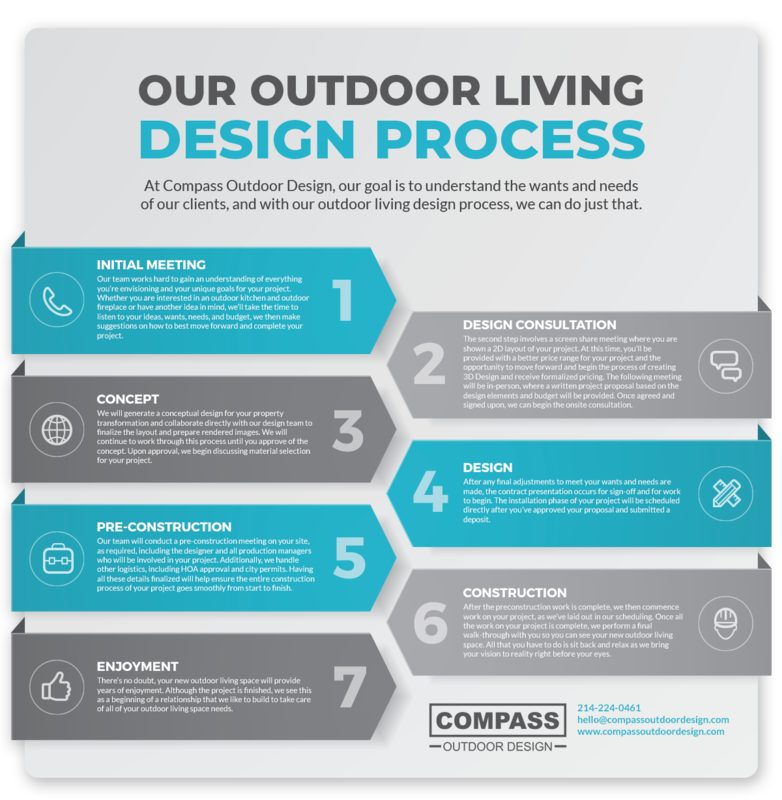 If you are ready to get the process started for your outdoor living space, contact the team at Compass Outdoor Design today!